Prada will launch Candy Night, a new fragrance for women. Candy Night is a flanker to 2011's Prada Candy, and follows 2018's Candy Sugar Pop. Experience Prada By Night. The contradiction of sparkling energy and addictive double-sweetness. The notes for the gourmand oriental include orange, chocolate, caramel and white musk. 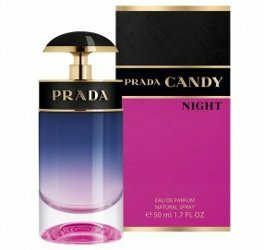 Prada Candy Night will be available in 30, 50 and 80 ml Eau de Toilette. It might be an absolute mess, but also could be a guilty pleasure. I know I’ll try it if I see it. Love the bottle. I’ll be waiting for this one to hit Sephora.